If content marketing hasn’t been mentioned in your marketing engine room yet, chances are you’re already behind in the ongoing battle for better customer engagement. What may have been a new trend a year ago is now business as usual for successful brands. For those still unsure, content marketing should be considered with the early days of social media marketing in mind – immerse in it because it ain’t going anywhere in a hurry. Here’s a quick guide on content marketing and how it can be incorporated into your marketing communications mix this year. In March last year, The Australian reported that Australian companies allocated 25 per cent of total marketing spend to content marketing. It’d be much higher now as companies continue to bypass traditional media by creating their own media and content, allowing greater control over message and story with the more direct access to audience. Think what supermarket giants do with in-store magazines made easier and cheaper for all brands through multiple digital channels that allow images, memes, blogs, case studies, videos and infographics to be shared with their audience. – Curation is key: help customers make sense of all the content on the web with your own personal story, rather than simply regurgitating what others are saying. Develop content that is fresh and your own. – What customers want: it’s not about you, it’s about them. Listening to and answering your customers by developing informative and useful content will improve engagement. This is why good infographics are so successful. – Innovation: storify.com is an easy to use tool that repackages existing social media interaction into shareable designed content. The right content will blend original work and community-created content together. – Mileage from earned media: ever received great coverage in the media and not known how to leverage it? Earned media is great content to use for blogs and social media channels. Like most things, sensible planning is the best approach to content marketing. Think about how it can flow to all marketing channels before you start producing it – how to best address a highly-informed audience and ensure messages have cut-through among the oversupply of content available through multiple channels. Bear in mind the balance between both your marketing and communication goals when planning. If content looks too much like advertising, you’re wasting your time. 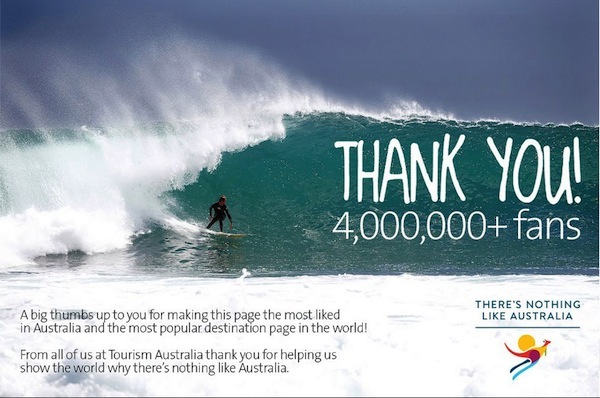 We love an Aussie success story, so for inspiration check out how Tourism Australia became the most popular destination on Facebook and, in particular, how they engage their audience through encouraging user-generated content and brand ambassadors.